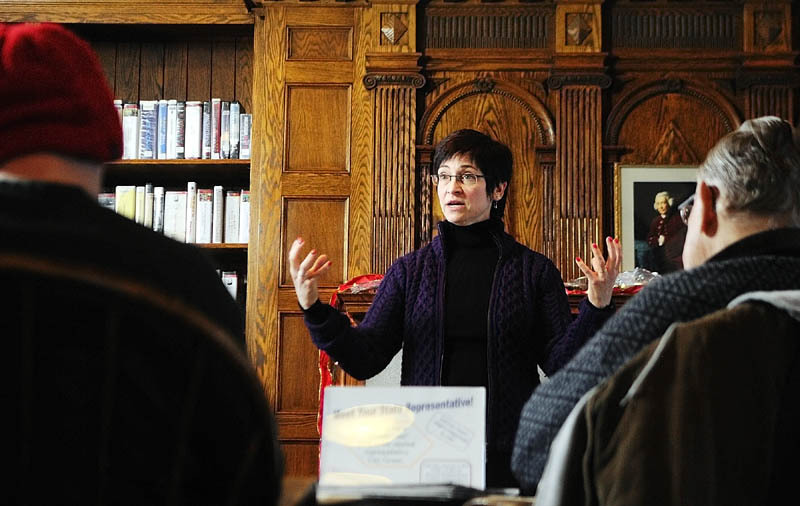 GARDINER -- A handful of area residents gathered on Saturday morning in the Gardiner Public Library's Hazzard Reading Room to tell their new legislator about issues they care about. 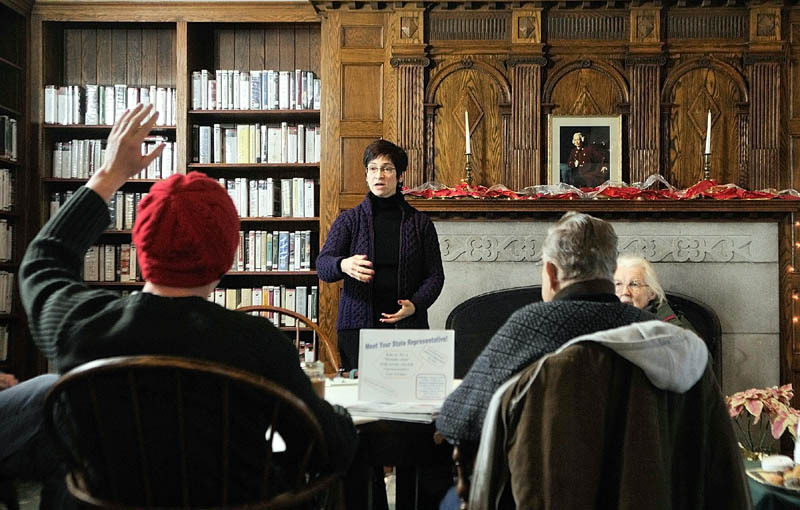 GARDINER — A handful of area residents gathered on Saturday morning in the Gardiner Public Library’s Hazzard Reading Room to tell their new legislator about issues they care about. Rep. Gay Grant, D-Gardiner, said she was pleased with the turnout of her first public chat with her new constituents, held to gather public opinion before the Jan. 18 deadline to submit bills. “I am so excited that people cared enough to come out here on a cold Saturday,” said Grant, after wrapping up the town hall-style meeting, which drew around 10 people. She said she was particularly pleased with the variety of people and the topics discussed, which ranged from concerns about the environment and cuts to state services to ways of improving public transportation. Alex Rosenberg and Veronique Vindette, of Gardiner, took part in the discussion while taking turns holding their 7-month-old son, Leo Venrosen, on their laps. Rosenberg, 30, said he went to the chat because he’s trying to reacclimate himself to local politics after spending several years out of the country. Vindette, 33, said she’s originally from Canada, and she and Rosenberg moved to Maine from there last year. Rosenberg said he thought the meeting was a good introduction for constituents who might not know how their voices can be heard through their representatives, although he wished it had lasted longer. “It was a good introduction. You’ve got to start somewhere,” he said. Rosenberg and Vindette both expressed interest in encouraging local farming, which they do themselves on their acre of land on Brunswick Avenue. Vindette said they care about environmental issues as a whole, as well as improving Maine’s public transportation. “We’re quite interested in politics at the local level, the regional level,” Rosenberg said. Grant said the only bill she plans to submit is a memorial sentiment about Daniel Bates, 61, her original Republican opponent, who died of an apparent heart attack at the end of September. She’s also looking into ways of better advertising the benefits of the Opportunity Maine Program, which reimburses student loan payments to Maine college graduates who continue to live and work in the state. “I think it’s one of the best-kept secrets around,” she said. Grant said she’s still researching other issues to come up with bills to either sponsor or co-sponsor with other representatives. 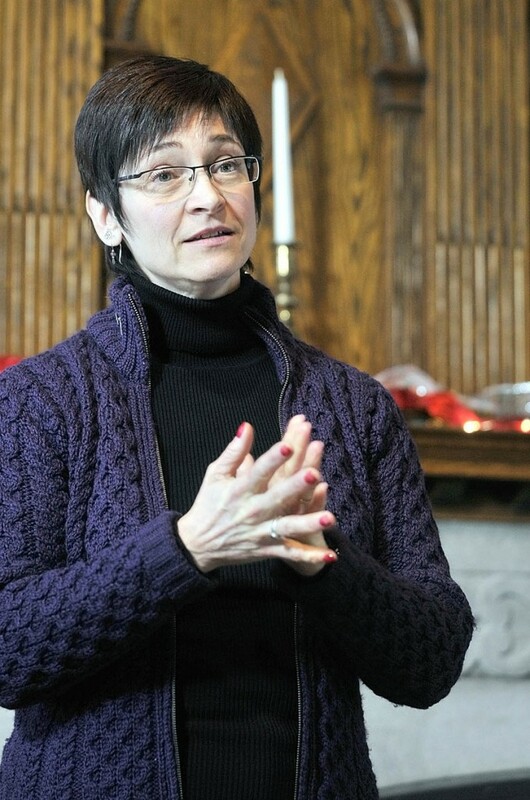 “As a new legislator, I’m not going to go in and pepper the place with bills,” she said. Grant defeated Shirley Hanley in November to replace Stephen Hanley, who couldn’t seek re-election because of term limits, for the district seat representing Gardiner and Randolph. She said she’ll continue the chats with the public every other month at both the library and somewhere in Randolph.